Are you going to miss her? YA THINK?!?! She’s our baby girl. What are you going to do with your time? I don’t know, crawling into a corner and crying seems like a legitimate use of my time. However, I am pretty sure my boss would frown upon that activity in front of customers. Are we going to miss watching her play sports? Umm… YES! We have spent the last six years traveling the country with her team who are like a second family. You are going to have to re-learn how to cook dinner. Why can’t we cook like normal and eat leftovers for 5 days? That will save us a ton of money in groceries… which I can use to purchase Kleenex in case I decide the corner looks appealing. We have spent a large percentage of the last 18 ½ years making sure we were raising the most amazing human being possible who we hope will become a valuable member of society. Now we find ourselves with a lot of fill that time. Therefore, we have decided that mind numbing entertainment such as books, music, movies, etc. are just the tickets. Then the thought came to me. 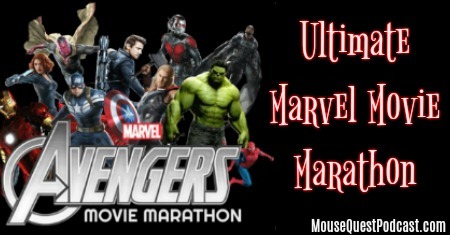 What if we watched the entire modern Marvel Cinematic Universe movies in order? That’s like 40 hours, right? Add that to the 40 hours we are at work each week and that will definitely take my mind off things. Then I thought, why don’t I involve all my MouseQuest friends? Surely, we could all use some fun escapism. Then a plan emerged. Starting next week, we will post one movie per week on #MovieMonday. During that week view the movie-of-the-week. As part of the fun, we will include some fun trivia, discussion topics and accompanying viewing. 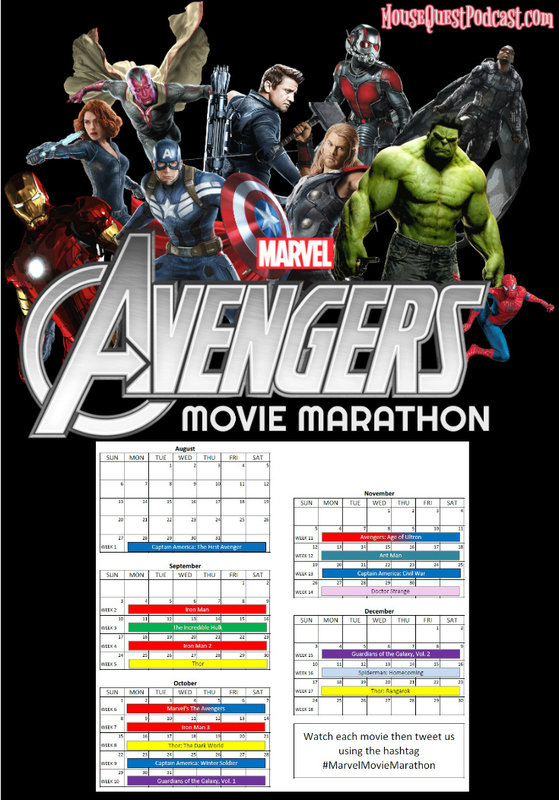 When you have finished watching the movie of the week let us know your thoughts about the movie or answer the discussion question on Facebook or Twitter using the hastag #MarvelMovieMarathon. So get ready, grab your popcorn and join the ride! See you next week with our first movie! Sue Nowicki is an alumna of the 2014/15 Disney Parks Moms Panel. She used to split her time between planning her next Walt Disney World vacation and being team mom to ten high-energy volleyball players where she fills the roles of secretary, navigator, head cheerleader, treasurer, athletic trainer and team psychologist. Now she is contemplating the use of her time as an empty nester. You can follow her on Twitter @MQPodcast. In a summer full of anticipated releases, it would be very easy to overlook Ant-Man. Doing so would be a mistake. Ant-man is, as any true believer knows, the latest installment in the Marvel Cinematic Universe.